Classic beef stroganoff is transformed into chicken stroganoff using chicken thighs and herbs complementary to poultry. You can substitute boneless, skinless chicken breasts for thighs and experiment with your favorite variety of mushrooms as variations on this recipe. Whether you use chicken breasts or thighs, you'll save money over using steak for beef stroganoff, and this substitution cuts down on red meat intake in the bargain. Cheaper and healthier -- can't beat that. In a large bowl, combine the flour, sage, thyme, salt and pepper. Add the chicken thighs and toss to coat. Heat a large, heavy, deep-sided skillet over medium heat. When the skillet is hot, add the olive oil and swirl to coat the bottom of the pan. Add the chicken pieces in a single layer and cook until lightly browned. Place the browned chicken in a bowl and set aside. In the same pan, melt the butter in the pan drippings. Add minced sweet onions, garlic and mushrooms. Toss to coat, then sprinkle with kosher salt to help the mushrooms release their liquid. Saute over low heat until the vegetables are lightly browned. Deglaze the pan with white wine and stir, scraping browned bits from the bottom. Cook about 2 minutes to boil off the alcohol. Add the chicken broth and simmer about 5 minutes. Return the chicken to the skillet and add the heavy cream. Simmer another 10 minutes or until the sauce is thickened. 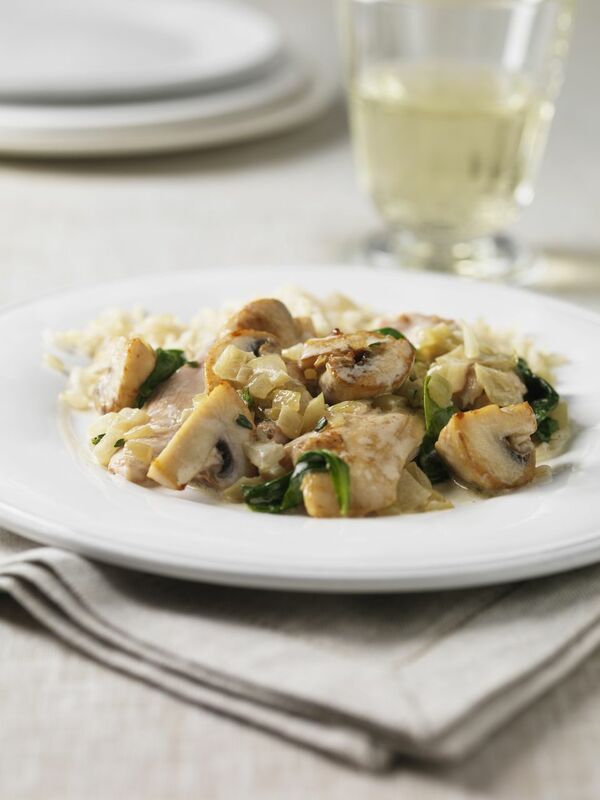 Serve chicken stroganoff over buttered and parsleyed noodles or rice pilaf. Serve with a green salad of red leaf lettuce, cucumbers, red onion and cherry tomatoes dressed with a sour cream-based dressing, French or Italian bread and dry white wine. If the wine you used to cook with is of good quality, it's a standard rule to also drink that with dinner. If the wine you used is for cooking only, crack open a bottle of Albarino, chardonnay, sauvignon blanc or a dry pinot gris for a satisfying pairing.